A Linux software development kit is available for Rhodeus. The Rhodeus Linux Kit (SDK-RDS-LNX) contains a 512MB CompactFlash disk with a bootable linux image pre-loaded, a software CD with the linux tool chain and a backup image, and documentation. 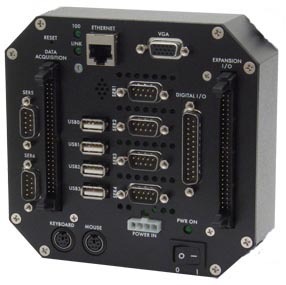 Rhodeus single board computers can be mounted inside Diamond's Pandora PC/104 enclosure with a cable-free panel I/O board to form a rugged, compact, completely self-contained industrial computer system. The Pandora enclosure, coupled with the panel I/O board, features fast and easy assembly because most or all internal cables can be eliminated. Rather than requiring the installation of special corner mounts or forcing the stack into a set of corner guides, the entire stack is bolted directly to the front plate of the case, forming a rugged, easily-handled assembly. Click here for more information on the Pandora PC/104 Enclosure. All I/O on Rhodeus is made available on 2mm pitch pin headers for use with low-cost cables. 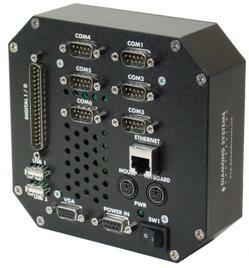 To enhance the use of Rhodeus in harsh environments requiring outstanding resistance to shock and vibration, Diamond Systems offers our rugged Pandora PC/104 enclosure that provides a cable-free configuration via a small panel I/O board that installs directly on top of the Rhodeus SBC to instantly convert all I/O to PC-style connectors. PC/104™ is a trademark of the PC/104 Embedded Consortium. All other trademarks are the property of their respective owners.